Any updates on a symmetry/mirror editing mode? I understand you're working on low-level stuff right now - do you think it will be possible to add this feature with the reworked version? julianr and matteumayo like this. For more than a month I was trying to get to this point using a data structure called "half-edges", but at the end I came to the conclusion that the way this data structure worked just made it too easy for things to break down. I felt like I was playing a game of whack a mole! So I switched to something else and had immediate results in a just couple of days! Unfortunately switching to this other data structure meant that I need to rewrite smoothing across multiple brushes, so that's the next thing on my list. N00MKRAD, matteumayo and doq like this. Good job, you are definitely killing SabreCSG when it comes to polycount. Sabre produced a S***load of polys, even compared to the current Realtime CSG version. I mean, it's kind of hard to smooth between edges if you don't know which edges lead to which edges, right? I still need to add some code to make sure all the vertices line up properly on those edges, split any edges when a vertex only exists on one side of the edge etc. but then it should be easy to finish the smoothing. doq, matteumayo and 2dgame like this. I'm considering moving to Unity 5.5 as the lowest supported version for Realtime-CSG , does anybody have a problem with this? The problem is that 2017.2 seems to have broken serialization which means realtime-CSG scene files from 5.4 won't load properly unless first saved in a later version. I just released a hotfix that fixes that. Other than that, as mentioned in the previous message, Unity 2017.2 has a bug which fails to import any Realtime-CSG scene/prefab that was saved in 5.4. 2. With the .FBX export for Real Time CSG does this export the materials and are the materials properly mapped as well on export? The FBX exporter uses the text FBX file format, which is not supported by every DCC tool unfortunately ..
HeadClot88 and julianr like this. You will eventually release the importer?? does that include .map format or is it .clx? can't remember its been a while and I think I used 3D Studio Creator. 1. What work needs to be done in order to release the hammer Importer? 2. Would it be possible to extend the map importer to work with .map files? Just started playing with this, and following the Introduction to Realtime CSG video. Right at the start you start generating shapes on top of other shapes, but to me it always snaps to the grid instead. Am I missing something? @terrivellmann Oh what the .. ? That looks weird, can you send me that scene file? The surface you're trying to create another brush on, is that a regular Unity mesh or other brushes? I'm also wondering, could it be related to using an isometric camera? can you try perspective? Those were other brushes, setting the scene view to perspective does work! I'm using the free version, and I keep getting "light leaks". You can see it on the shadows, there are ugly lines of light. Is that fixed in the paid version? I'm going to buy it soon, but this needs to be fixed. Damn, I only tried tweaking the bias, not normal bias. Works now, still looking forward to the update. Looks really interesting! Not sure why I never looked into Realtime CSG before. I notice some topology, working with spheres for example, can lead to some pretty dense spikes rather than a more spread approach. Is this something you have on your radar? @hippocoder I'm not sure what exactly you mean with "pretty dense spikes"? Can you describe what you mean or post a screenshot? Btw, you have a Unity Technologies acc, is there a chance Realtime CSG or parts of it will be integrated into Unity? Did you get to Unity because of Realtime CSG or for other reasons? The other reason was the ginger moustache that curls. Still, +1 my vote for including CSG style editing as a baseline Unity editor (and runtime) feature. xVergilx, Petethegoat and N00MKRAD like this. ...my lightmaps are all blocky (2017.2, PLM). High preset, 1024px. Is this a bug on RCSG's side? I touched a lot of code, so please make a backup before you try it. Also: please give me feedback how it works for you, if you see or do not see any issues in the generated mesh. 1.500 seems pretty good so far! I've had a few minor issues, one was some handle error that I ignored and haven't noticed since, but I have similar (as far as memory serves) errors when I create and extrude a concave polygon with the freedraw tool (in a brand new, empty model), and then try to chamfer any of the edges. The selected face is the one created by the chamfer. The transform gizmo very obviously stops doing what I want it to do when this happens as well. The other issue I've noticed, that appears to be fairly harmless, is sometimes while Realtime CSG is disabled with ctrl-f3 the model will seem to ignore or incorrectly create certain brushes. Don't know what causes it, but it happens consistently while I'm working on the project. Enabling Realtime CSG again seems to recreate the brushes properly. None of the ideas I tried to reproduce it worked, but I'll let you know if I figure it out. Do you have any updates on progress towards mirror/symmetry editing? @matteumayo What I'm working towards is to make brushes separate from brush-components. That will make it much easier for me to do things like mirror/symmetry editing since right now I'd have to create new game-objects to create the mirrored brushes .. Creating the brushes as game-objects would force me to keep the mirror and the original synchronized & have to worry about dangling brushes in case something goes wrong, or what would happen if the user changes the brushes etc. etc. If I can create these brushes under the hood without needing to create gameobjects, then I can simplify everything *a lot*. But it requires me to rework a lot of code. In the end things will be faster and more flexible though. xVergilx and matteumayo like this. As far as I understand this is an editor plugin to design your levels. Can you do any boolean operations real-time in-game? Unfortunately I still have to do a lot of work before runtime support is possible, so not; yet I'm afraid. Version 1.502 has been released, fixing some trigger issues and adds visualization of hidden, culled, shadow casting and shadow receiving surfaces. This version can be found here , you will need your invoice to download the update. It turned out 1.502 was compiled the wrong way (which caused it to be slower and spam the user with warnings), so I released 1.503 that fixes this. Sorry for the inconvenience! I just released version 1.504 , which fixes several issues. 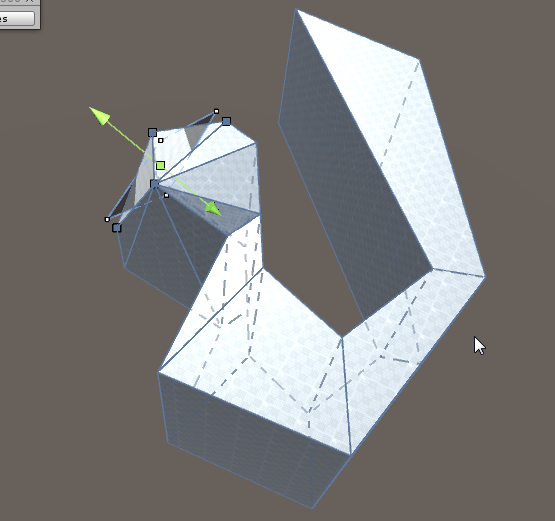 hi @logicalerror , I wonder if your tool is able to produce assets in a procedural or parametric way, think "houdini" or "archimatix", what I need is to assemble it in such a way that later I can reuse it to create multiple levels with similar designs, is that possible? @Cleverlie currently realtime-CSG has the building blocks to create levels with, eventually my goal is to add parametric / procedural stuff on top of this, in fact me wanting to make that is the whole reason why I've started this project. Petethegoat and Cleverlie like this. On the latest version, when I disable RealtimeCSG with Control F3 if will sometimes break the geometry when I hit play. Easy fix by enabing RealtimeCSG again but thought I'd report it. A question: can I create stairs that aren't filled? For example, here on this pic, the left one is what I can do but for the right one I need to edit the steps manually. Is there some trick to it? Also on the topic of stairs, it would be great it they stayed editable, so scaling them added/removed steps instead of actually scaling the geometry. Its one thing I usually end up editing a lot to get it just right.